Filming for the Womble movie in which Jimmy Cricket will play himself is now under way. 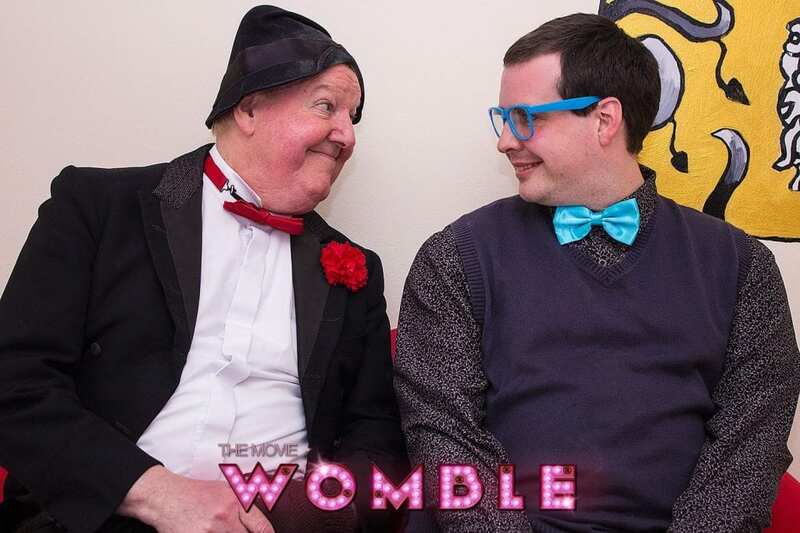 Famous entertainer Jimmy’s cameo role will be filmed on location in North Wales in June and he was recently involved in a photo shoot alongside the central character Womble, played by actor Tom Spencer. Also at the promotional event, which was held at the Bojangles Theatre, home to the Middleton Popstars Academy in North Manchester, were director Lee Howard, co-writer and actress Gemma Jones, and fellow actress Georgina Ford. 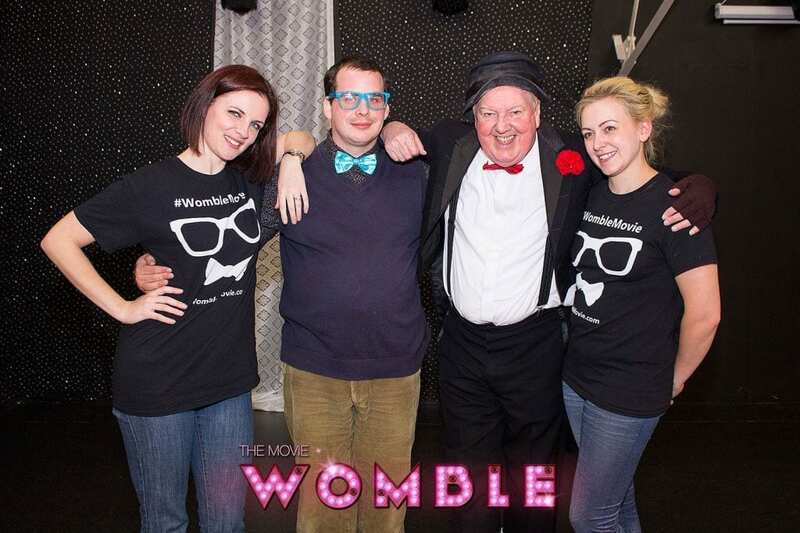 The film is about a man called Aloysius Rupert Womble (played by actor and comedian Tom), who is in his 30s and living with Asperger’s Syndrome in a typical seaside resort town. Children and adults affected by Asperger’s Syndrome have difficulty with social interactions and exhibit a restricted range of interests and/or repetitive behaviours. Aloysius’s dream is to become a stand-up comedian. The film is a week-long snapshot of his life as he goes through the trials of living with a cognitive disorder, while dealing with the injustices forced upon him by society and parts of his community. Over the seven-day period he prepares for the biggest night of his life – a talent show in his local pub. It will feature songs from the Beautiful South’s former lead singer Briana Corrigan and American Pie star Thomas Nicholas as well as a string of original songs written by songwriters especially for the movie. Top comedian Jimmy, 69, will play himself as a talent contest judge. Watch a special photo slideshow of Jimmy Cricket’s visit to Middleton Popstars Academy in North Manchester. The well-known comedian met youngsters involved in performance and dance activities as well as music and event production. And he returns to see the Popstars team on 11 July to appear at their Bojangles Theatre, where he will act as the show’s host as they present some of their best routines. For tickets to see the event, please ring the Popstars on 0161 653 7747. To play the slideshow, click on either of the arrow buttons above (note that there is no sound). You can view it in fullscreen by clicking on the diamond shape on the bottom right-hand side of the feature. 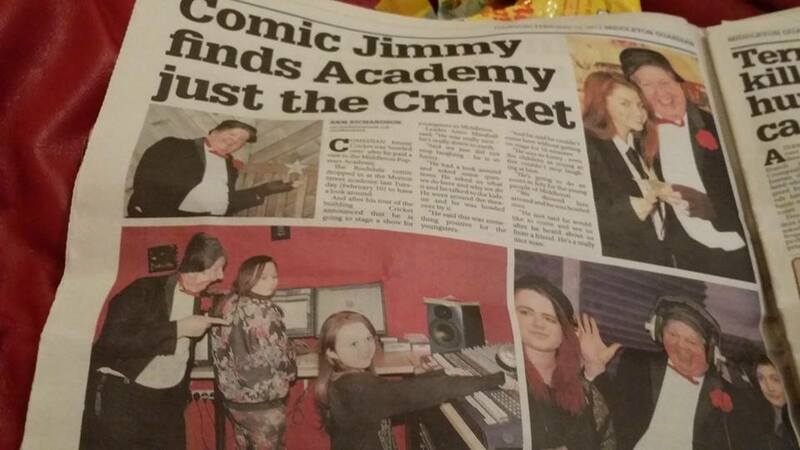 Jimmy Cricket’s meeting earlier this month with a group of talented young people was covered in the local press. 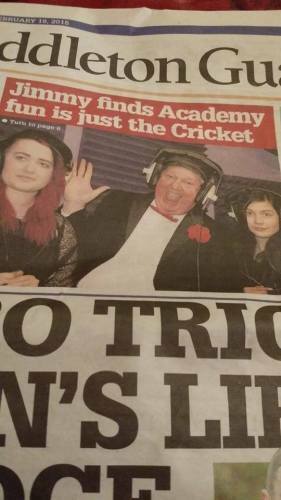 The 19 February edition of the Middleton Guardian reported on famous entertainer Jimmy’s visit to the Middleton Popstars Academy in North Manchester. He met youngsters who were involved in not just performance and dance activities, but also in music and event production. His visit went so well that he will return to the Popstars base on the evening of 11 July to appear at their Bojangles Theatre. It should be a great night’s entertainment with Jimmy set to act as the show’s host for the Popstars, who will be presenting some of their best routines. For tickets to the event, please ring the Popstars on 0161 653 7747. The 90-seater Bojangles Theatre on Morton Street in Middleton town centre officially opened in February last year and cost £75,000 to build. The name was chosen to honour former student Jack McLean, who wowed audiences with his rendition of Mr Bojangles before his death three years ago.